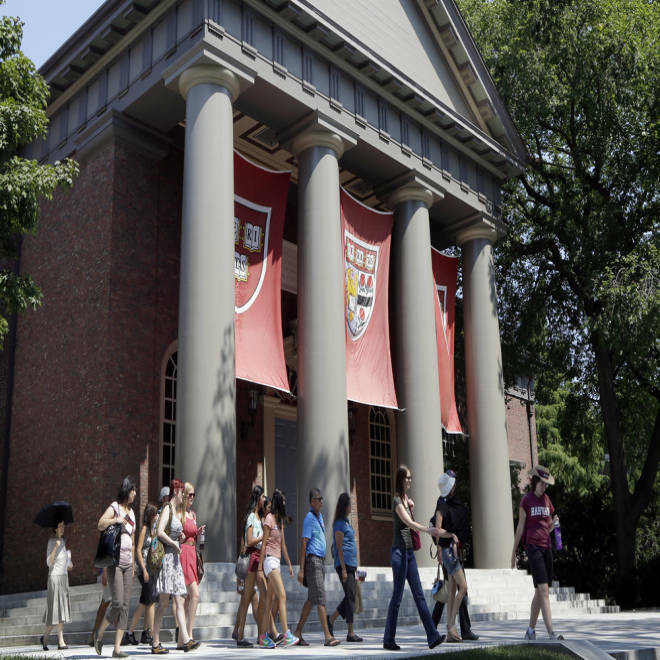 Glitches in an online application system could hinder some students from getting into schools like Harvard University. One of the most difficult assignments soon-to-be college students are facing is completing their college application process thanks to bugs in the online process. Kenji Johnston, a 17-year-old high school senior in Bloomfield Township, Mich., thought he had gotten the hard stuff over with: He has a high grade point average, he scored well on his standardized tests. But when he tried to apply early-action to Harvard and the University of Michigan, technical glitches with the Common Application, a universally accepted application at more than 500 colleges and universities, turned the experience into a nightmare. "It crashed every single time I put in something new. The browser would just log me out. It would delete everything," he said. "It took me forever. I had to use Firefox and Chrome, and all these different browsers." Johnston was finally able to submit his applications a couple days ago, but he has only heard back from University of Michigan, and isn't sure the application to Harvard went through. "It worked out. It was just really frustrating. I'm just worried [about Harvard]," he said. "It's just really confusing. Since it's a really widely used program, I don't understand why it's so hard to use." College students across the country are wondering the same thing. The "Common App" generally makes the application process easier by allowing prospective students to apply to multiple schools at one time. But this year, after a rollout of a new online version in August, the nonprofit that runs the Common App has been flooded with complaints of computer problems. The issues, which range from students not being able to upload letters of recommendation to getting charged more than once for filling out the application, have prompted numerous schools to push back key deadlines for applicants. "As with any new technological launch, some difficulties arose after launch and as more users interacted with the system. We have been responding immediately to these issues as they occur, and we are proactively testing and improving the system to reduce the risk and impact of any future issues," Scott Anderson, The Common Application director of policy, said via email. "We have been vigorously preparing for the expected increase in volume in advance of November 1st deadlines. We have brought in more individuals to handle both customer support and any technical issues. Our goal is to make this a smooth process for applicants and members," Anderson said. On Oct. 18, the organization released a statement apologizing for being "too slow to respond" to the technical glitches and pledging to improve its service for the 800,000 users who had already registered at that time. University of North Carolina at Chapel Hill and Georgia Tech extended their early-action deadlines, originally Oct. 15, to Oct. 21; Dartmouth, Tufts, Cornell, Johns Hopkins, Columbia and Northwestern extended their Nov. 1 early-decision deadlines by a week, to name a few. "We had not been reassured that the Common App was going to work out all of the problems by the Nov. 1 deadline, and indeed, it doesn't appear that they have," said Christopher Watson, dean of undergraduate admissions at Northwestern, adding students wouldn't be penalized for turning in their applications later. "We've always been understanding. This is not the first time we've extended a deadline. Last year we did it for Hurricane Sandy," he said. Lots of worried students and high school guidance counselors have been calling Northwestern's admissions office, he said. "Unfortunately, we just have to refer them back to the Common Application. Our job right now is to assure them they truly do have until November 8. If we have to, we'll look at extending the deadline another week, but we haven't made that decision yet because we've had reassurances from the Common App that everything will work out in time." Maria Laskaris, dean of admissions and financial aid at Dartmouth College, which also extended its early-decision deadline last year when Sandy hit on Oct. 29, 2012, said Dartmouth pushed back its deadline again this year because "clearly things were getting to quite a fever pitch in terms of stress around the system and applying, which is stressful to begin with." The difficulties with the Common App, which have included frozen screens, trouble uploading letters of recommendation, formatting of essays appearing wrong, and inability to go back and check work have prompted some schools to expand their application process. Not everyone has had a negative experience. Scott Chrysler, academic dean and college counselor at the Episcopal School of Acadiana in Cane, La., said his class of 43 graduating seniors has barely encountered trouble with the Common App at all. "My kids have run into no problems except for the paragraph breaks in their essays," he said. "I had one problem: I had my browser misconfigured. As soon as I changed to a native viewer in the browser, everything has worked fine." Nonetheless, Joshua Reiter, president of ApplicationsOnline and founder of the Universal College Application — a standardized, lesser-known application accepted by 37 colleges — said he's received a lot more interest from schools recently. Princeton, previously an exclusive user of the Common App, joined the Universal College Application this year, as did Tufts, Trinity College in Connecticut, Hampshire College in Massachusetts, and Washington University in St. Louis. "We've been busier than we have been in the past years," he said. "We have quite a few institutions that we have been chatting with, and quite a few of them have been following up with us." Reiter said the glitches could encourage institutions to broaden their application process. "I certainly can understand why some institutions would like to have one application. It makes it easier for the candidates: There's one way to apply. It makes it easier for the college because they have one way to access and download data. But now maybe they have to rethink their perspective," he said. Watson, the dean of admissions at Northwestern, which doesn't accept the Universal College Application, said he will consider other choices besides the Common App in the future. "I'm sure after this, we'll start looking into other options, not necessarily because we want to abandon Common Application, but maybe it's important for students to have a couple of choices," he said. Despite the difficulties, applications for early decision at Northwestern are slightly up over last year, he said. Dartmouth, which relies exclusively on the Common App, may also consider other options. "We will spend some time this winter and spring debriefing and thinking about whether we want to remain exclusive with Common App and whether we might want to have a second application portal for students to have that might be something we build ourselves, that might be working with another provider," Laskaris said. The Common App was created in 1975 as a paper application, mailed in to schools. It first went online in 1998 and now serves over a million students and more than 500 public and private colleges and universities, including all the Ivy League schools.